Philippe Le May serves as Chief Technology Officer for Altice USA, where his focus is on accelerating the development and delivery of key initiatives such as the build out and expansion of the Company’s fiber network infrastructure, upgrades to the new home communications hub, wireless technology initiatives and next generation products and services. Mr. Le May has more than 25 years of experience in the telecommunications industry and joined Altice France in 2006, most recently serving as its CTO at SFR where he successfully led the Company’s full-scale fiber build, implementation of its home communications hub, and massive deployment of 4G/4G+ technology in France. Before joining Altice, Mr. 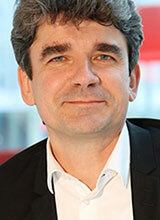 Le May held the position of Head of Network Engineering at Lyonnaise Communications where he supervised the merger of the cable networks of Lyonnaise Communications, NTL and UPC France. Prior to his work at Lyonnaise, Mr. Le May was Manager of Fixed Access Network on the Architecture Team for Cegetel/SFR. He started his career as a Project Engineer at Philips. Mr. Le May is an Engineer and Computer Science graduate from Telecom Paris Tech.